In 1824 a family of vodka artisans fled the Russian Empire to escape religious persecution and settled in the mountain town of Tzfat, now within the borders of Israel. To this small and spiritually devout village — the center of Kabbalah — the family brought the vodka making secrets that it had perfected since the eighteenth century. 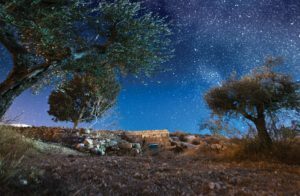 One attraction of Tzfat was its access to a superlative supply of water: the nearby Sea of Galilee, a place of spiritual renown and the world’s lowest fresh water source. Water is crucially important in the vodka-making process. The Sea of Galilee, draws from the pure tributaries which run down Mt. Meron and Mt. Hermon. From this line of vodka artisans comes Yossi Gold, the master distiller of AVIV® 613. His father was a master distiller, as were his grandfather and great-grandfather, and so on all the way back to 1824. We believe our great moments should be celebrated, remembered, and cherished. We toast celebrations of life, the spiritual power of joy, the universal pursuit of happiness, and the wonderful days ahead. We seek harmony and balance to shield us from the trials and tribulations of daily life-lifting a glass to life’s precious moments, goodwill towards each other, unity of family, our intimate circle of friends, and the rituals that unite us. We believe in toasting the Force greater than us, Wisdom, Understanding, Acts of love, Strength, Beauty, Victory, Glory, Justice, Leader­ship, and Knowledge. We believe in goodwill towards each other and equal rights for all people regardless of gender, race, color, religion, or sexual orientation. We believe good thoughts have the power to generate a cyclical force that will make the world an infinitely better place, bestowing reward upon the good hearted and the people we love. As life unfolds in front of us, we believe positive spiritual energy has the power to better the world. We believe spiritual energy is created by acts of loving-kindness and initiated by good thoughts. We can all believe in the power of good thoughts.